Perfectly portioned, this zesty seafood cocktail sauce will deliver just the right amount of bold flavor to your customers' food. These 1 oz. portion control cups are ideal for any restaurant, diner, convenience store, cafeteria, or take-out station and offer a quick and easy way to enhance profitable menu items. Flavor Fresh fills each cup of sauce with fresh, wholesome ingredients and flavorful spices. 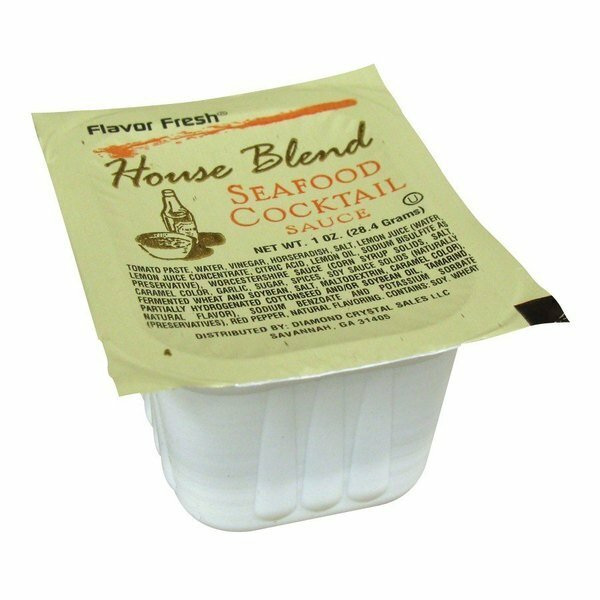 This rich seafood cocktail sauce is perfect for enhancing a variety of popular seafood items such as shrimp, fish, oysters and crab cakes with a savory taste. Bursting with bold flavor, this seafood cocktail sauce is the perfect fusion of fresh-from-the-vine tomatoes, spicy horseradish and Worcestershire sauce peppered with savory garlic, onion and aromatic spices and herbs. Made from only natural ingredients, this seafood cocktail sauce will delight your customers with the classic taste they know and love. We absolutely love these, it saves us on the mess of cupping ourselves and the labor. These are perfect cups for anyone considering using them, and they come packed very well. Even though this is a low-cost cocktail sauce, it is a better quality and better-tasting sauce compared to other sauces that cost more. It is the right size for bite-size fish and shrimp. I would purchase this again. These are a great idea for faster paced restaurants, we used to cup up gallons of cocktail sauce which ended up being messy and too time consuming when we are in a rush. These work great and have a better shelf life then an open gallon of cocktail sauce! A great way to serve cocktail sauce with our seafood platters. The cups are a perfect size and the cocktail sauces tastes amazing. Very satisfied. A great cocktail sauce is wonderful portion cups that making dipping shrimp a breeze. The cups are perfect size and are great for to go orders. This is a great tasting cocktail sauce but I wish it was a little bigger in size. My customers keep coming back for more. The packaging holds up well in shipping. This product did not work for us very well. The taste was not well liked . The price was fair and the size was good, just did not like how it looked or tasted. We appreciate your review, Donna! If you are looking for a different product that would better suit your needs, please contact our Customer Solutions team. We have been using this cocktail sauce for years. It is great for shrimp and the portion cups are ideal for them. The price is also a lot cheaper than our distributor and is the same brand. We appreciate your review, Jo! If you are looking for more information on the product that you are purchasing, please contact our Customer Solutions team. Perfect portion cups!! Great price that is excellent in controlling costs! The taste is great! Very flavorful! Goes well with shrimp and even freshly shucked oysters! !